Today I am giving you a sneak peek into my real-life planner to show you how I plan out everything from blog posts to workouts to family events. 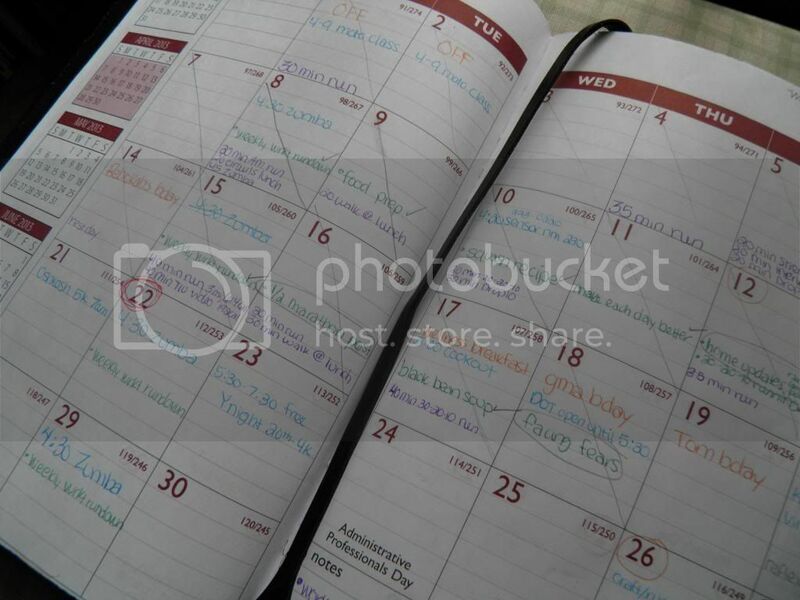 I originally intended to create my own planner in Microsoft Publisher or some other program, but it was getting too tedious and, as I decided, unnecessary. The problem is that I wanted to track too many things in one place and that got a little bit out of hand. Ok, so you can see how this might get a little overwhelming. Taking a step back, I thought about how I could get all of these onto one page or how I could narrow down all of these trackers a little bit. The answer came to me from inside a little bag from a vendor here at work. Colored gel pens! With that, I grabbed a leather-like journal cover I had, a 2013 planner already in my possession (cut down just a bit to fit inside the journal), and a few sheaths of paper and got to work. Instead of tracking everything separately, now I track everything together, just in different colors. That way, it's easy to see what's what and to see everything at the same time. Also, it helps prevent me from lugging a giant-sized planner with me everywhere. I really didn't want something else to lug around. I'm a mom, so that's a constant concern of mine. On each date block, I record all things listed in my color key above. I try to keep family events and birthday reminders toward the top, blog post topics in the middle and workouts toward the bottom. That way, I have a nice consistent structure. I just write out workouts as you can see below, with miles and calories listed if I'm tracking them. Simple enough! 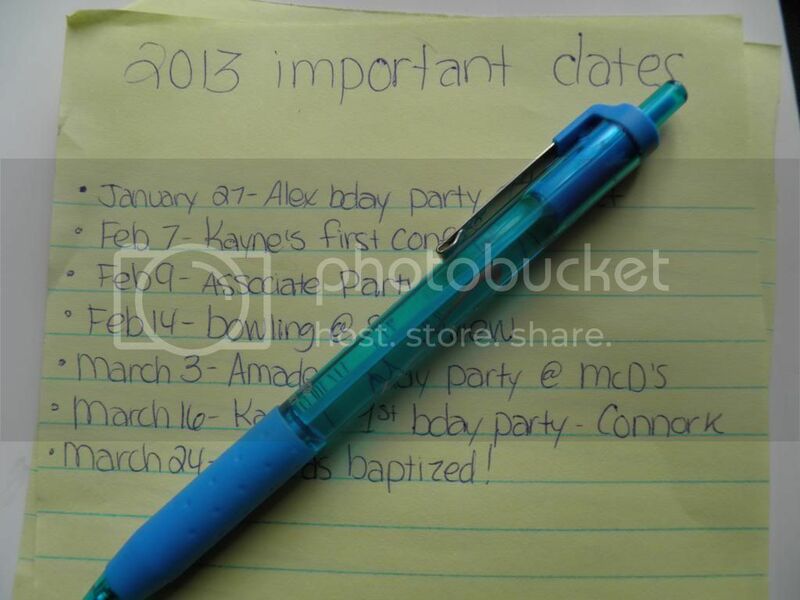 I then record milestones and memorable occasions in the little "notes" section. 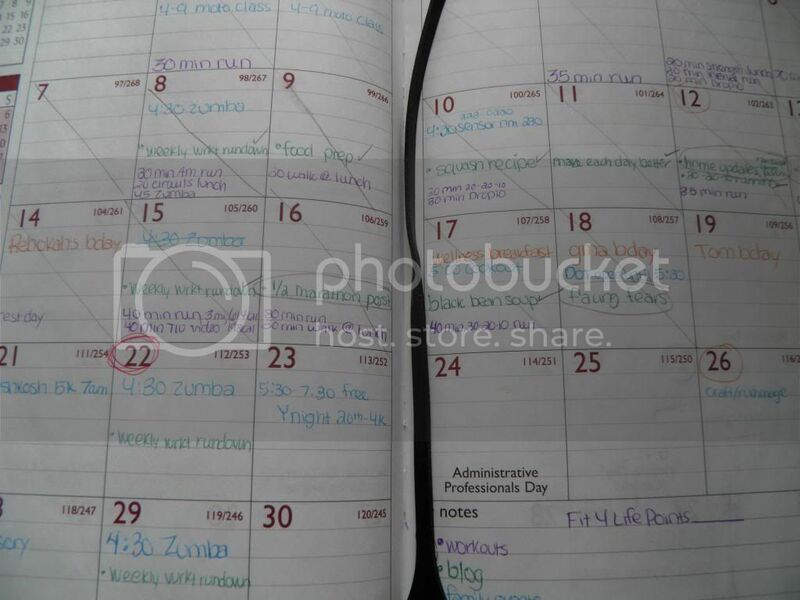 I transfer those dates and events to a yellow sheet tucked in the back of the journal. This way, when the year is over, I can recycle the planner right away but still keep a record of important moments throughout the year. 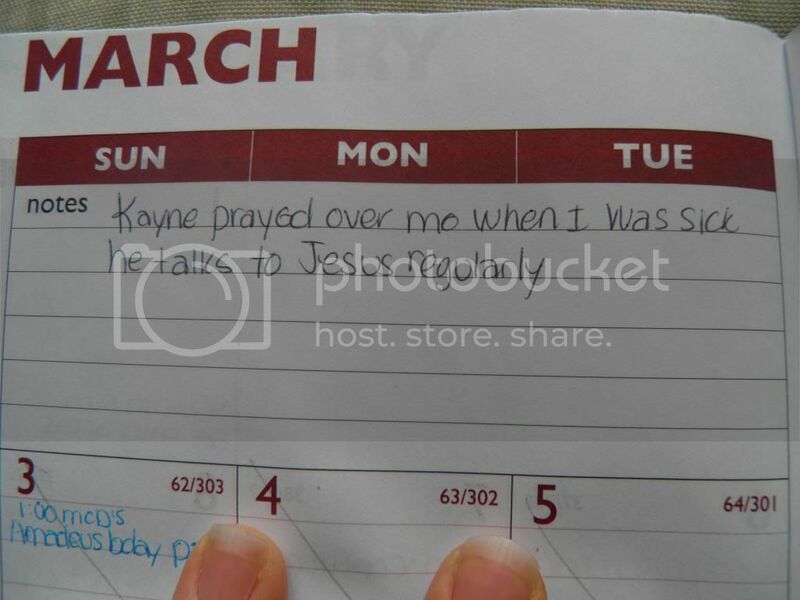 Sometimes I'll use these dates for scrapbooks or memory books. It's just nice to have a list of each year's accomplishments, even if they aren't put into a scrapbook. We all know how hard it is to remember when you took that amazing vacation or which day your toddler learned how to form a sentence. I've been doing this since my son was a baby, and I can tell you for certain that had I not written his first steps, first tooth, first haircut in my planner, I never would have remembered when they happened. It's also neat to be able to go back over these sheets each year and see what you were able to accomplish. Isn't this just the cutest? My entire planner stays on my desk at work so I don't have to cart yet another thing around on my poor shoulders. Sometimes I take the planner home on the weekends if we have a particularly full weekend planned. However, I do sometimes get into trouble when people ask me what I'm doing three weekends from now and I don't have the planner in front of me, but oh well. Grocery lists and meal plans, I'm keeping on separate sheets. I just use a printable like this to plan out my meals and what ingredients I'll need to pick up. Then, I hang the list from the fridge and reference it throughout the week. This way, I don't have to lug around a separate food journal and I can simply recycle the sheet at the end of the week. Plus no one ever asks what we have to eat in the house/for dinner. The act of actually eating healthy is strongly dependent upon a healthy meal planning system--fail to plan, plan to fail. If I'm tracking my food calorie for calorie (I do so occasionally to make sure I'm on track), I use the online calculator on SparkPeople. Daily to-do lists I'm also keeping separate in a teeny little Tone it Up journal from the Cyber Monday deal. I may insert a post-it here and there to remember this or that without wasting pages. 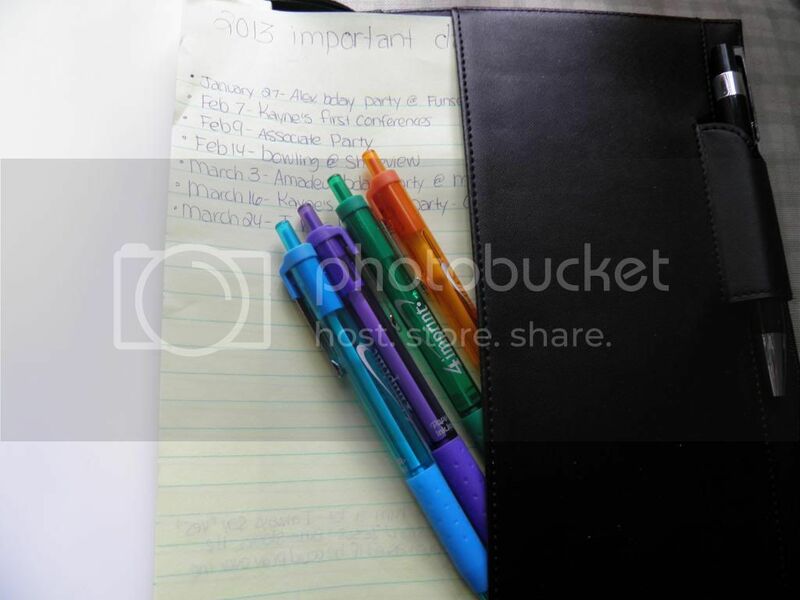 I keep the journal in my purse to stay on task each day. This is where my goals are broken down into steps and phone numbers are written down for those I need to contact--that sort of thing. I have another separate notebook, divided by subject, that I keep blog brainstorms and tips of the trade in. I also jot down helpful blog layout tutorials and traffic-building ideas in there. This notebook usually stays at home next to my computer and I only reference it or transfer ideas into it when needed. It's not something that I need to worry about keeping track of on a daily basis, because my blog post ideas are usually spread out over the week in my planner already. I've decided to go with a gratitude journal app on my phone instead of keeping paper copies of that too. I do like to look back on these (i.e. don't want to throw them away), but I don't want to keep a paper notebook of them (more clutter). So, I'm recording these digitally, only when I feel I need a boost or have something really special to record. Yes, I do think a gratitude journal is important enough to not exclude. There is so much research out there that correlates gratitude journals to happiness. They help change thought patterns to the positive, encourage you to embrace what is going right, remind you of all that you have, and help you feel fulfilled (just Google it). I ain't giving that up! 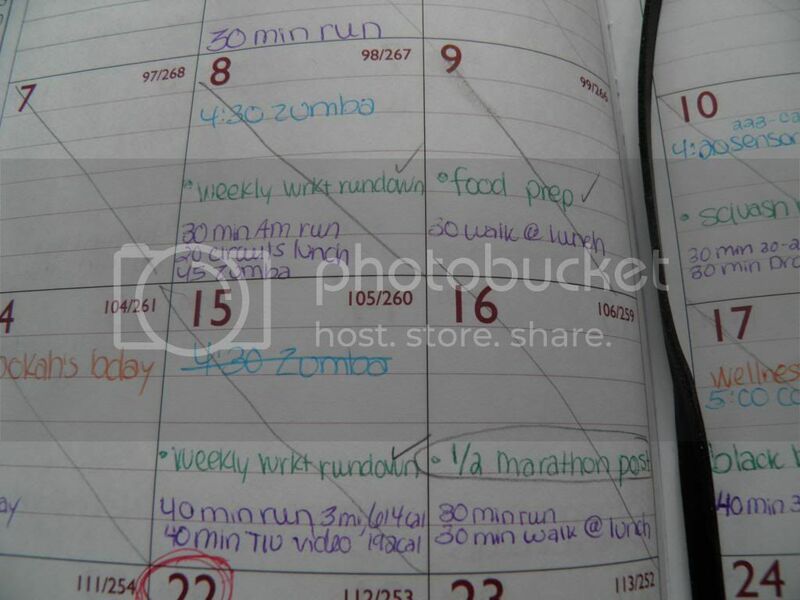 So there you have it, a glimpse into the real-life planning system of a regular momma, writer, and fitness fanatic. Doable right? How do you keep everything straight?